These are strange times. Bitcoin is a long way from its all-time high, the market situation resembles the dotcom bubble on steroids and yet there’s not that much information on Bitcoin and we are yet to see the sort of panic that accompanies major crashes. Yet, the sentiment is shifting. Stephen Innes, head of Asia Pacific trading at Oanda, is arguing that the bitcoin bear market is far from over because the No. 1 digital currency has yet provide a significant use case. “Bitcoins have gone well beyond the ridiculousness of tulip bulb mania,” he said on Monday. The fact that the price surge we saw in late 2017 was something reflecting the tulip mania is something to consider. The way Bitcoin rose surpassed the magnitudes of the moves during both the Japanese bubble of the late 1980s and early 1990s, and the dotcom bubble of the late 1990s and early 2000s. Let that sink in. Bitcoin’s appreciation was way beyond anything we had seen during the Japanese and dotcom bubbles. But does the currency still have lower to go? An answer based on the analysis of historic bubbles would have to be: “possibly.” Can we do better than that? On BitStamp, we are seeing some action, which could be considered sideways trading, and not much more as far as prices are concerned. The currency stopped the decline and went up a bit in the last couple of days. However, if we put this action into perspective, the last couple of days are not a period of very strong action. Consequently, this doesn’t constitute a strong reversal at this point. Particularly that Bitcoin hasn’t been going up on strong volume. Also, none of the action we’ve seen recently has changed the short-term outlook. Another consideration is the fact that if we take a look at the very recent local bottom of November 25 at around $3,500, Bitcoin is still trading not far from this level after moving below it. We have seen a confirmed breakdown below this level. This slide below the $3,500 level could start another move to the downside. 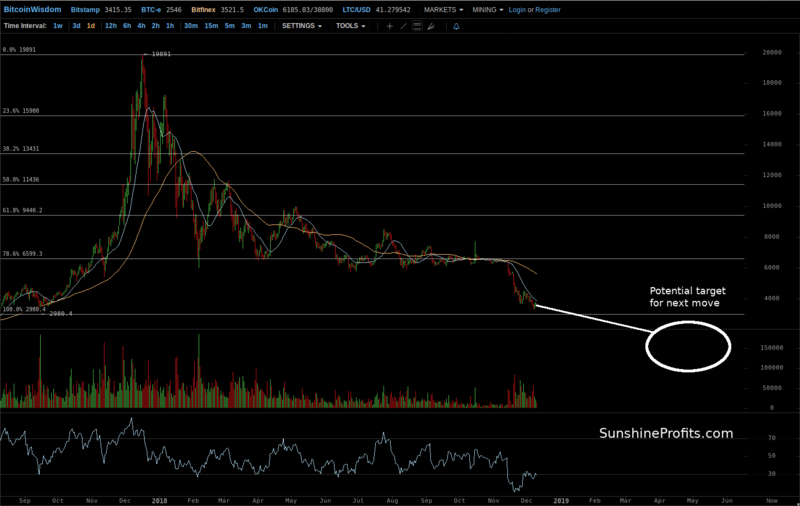 On the long-term Bitfinex chart, we are seeing the depreciation quite clearly. The rebound of the last couple of days is almost not visible. Based on the move from around $3,000 to $20,000, which was the bulk of the move to the all-time high, we see that Bitcoin has gone crashing down. Actually, Bitcoin has been in a general downtrend ever since the all-time high was reached. In other terms, almost all of the move to the all-time high has now been reversed. This is a very powerful sign that the long-term picture is bearish. But there’s more than that. The RSI on the long-term chart is now around 30, which means that the index is in the grey zone between regular and oversold conditions. This might mean that there’s still more room for declines. In other words, the recent move up might have been enough of a correction and the move down might resume. If Bitcoin does go down from here, then the level of $3,000 might be a crucial one. First, it’s a psychological barrier but, more importantly, it coincides with the level of the September 2017 low. If we see a confirmed breakdown below this level, Bitcoin might go a lot lower. We have not seen such a confirmation yet, but we’re very much on the lookout for it. 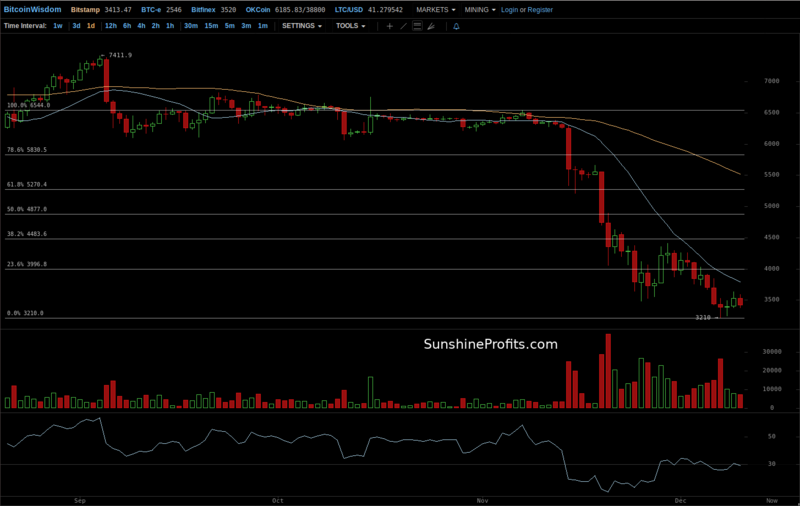 Summing up, Bitcoin is close to confirming a move below the recent low and the declines could continue. If you have enjoyed the above analysis and would like to receive free follow-ups, we encourage you to sign up for our daily newsletter – it’s free and if you don’t like it, you can unsubscribe with just 2 clicks. If you sign up today, you’ll also get 7 days of free access to our premium daily Gold & Silver Trading Alerts.